How confident are you in the performance and health of your walk in refrigerators, Danvers business owners? If your answer isn’t as positive as it should be, you need help from United Service Co. Inefficient, broken, and old walk in refrigerators can spell trouble for your business. Whether you run a restaurant, convenience store, or hospital, you need to be able to depend on your walk ins. Anything less than optimal performance can lead to higher energy bills and expensive breakdowns. Depending on your industry, a walk in refrigerator breakdown can be incredibly inconvenient and even dangerous. Come to United Service Co. for all your commercial refrigeration needs. Explore our services. The business of walk in refrigerators in Danvers isn’t something that just any company can do. It takes years of training, experience, and education to fully understand this industry. Walk in coolers and freezers are complex pieces of equipment, especially on a large industrial scale. Businesses need professional technicians they can rely on for the sale, installation, and service of walk in refrigeration units. Exceptional technicians. We only hire the most courteous, friendly, and professional technicians to provide services to our customers. Our team is highly trained, qualified, and licensed to work on a variety of commercial and residential appliances, including most walk in refrigerators in Danvers. Decades of experience. Our team has more than 100 years of combined experience in our area of expertise. When you converse with someone from United Service Co., you can rest assured the information you receive is accurate and reliable. Our repairs and services come out of extensive hands-on experience in the subject matter. High-quality repairs and materials. At United Service Co., we know refrigeration services are only as good as the quality of the parts and labor. We bring true craftsmanship to commercial applications and only work with top brands for parts and walk in refrigerators in Danvers. Trustworthy accreditations. We boast an A+ rating with the Better Business Bureau – the highest award the BBB offers. To achieve this rating, a company must have positive reviews, reliable services, and above-standard performance. The BBB also considers any complaints against the company and its length of time in business. Competitively priced equipment. We keep our prices fair and competitive to give our buyers peace of mind during the shopping experience. Whether you’re in the market for an industrial-size walk in cooler or a simple reach-in commercial refrigerator, you can find it at the right price with us. Browse our online catalog. 24/7 emergency services. Not every company offers around-the-clock emergency services on walk in refrigerators in Danvers. We recognize the importance of your coolers and freezers to the operation of your business and will conduct emergency repairs anytime, night or day, even on weekends. Comprehensive service list. 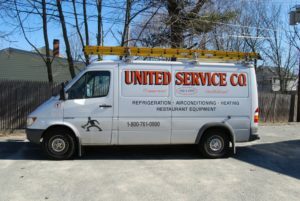 United Service Co. works on much more than just walk in refrigerators in Danvers. We provide a long list of commercial and residential services, including preventative maintenance, sales, installations, restaurant equipment repair, and HVAC services. We are truly a one-stop shop. Dependable preventative maintenance. United Service Co. offers preventative maintenance programs for all types of businesses in New England. Routine maintenance can keep your appliances in top working condition and prevent costly breakdowns and major repairs. Operate your business without fear of interruption. Custom designs and builds. Don’t see what you need in our product catalog? Not to worry – we partner with U.S. Cooler to design, create, build, and install custom walk in refrigerators in Danvers. No matter what size, shape, or cooling capacity you need, request a quote from our innovative team. Fast, reliable services. If your commercial appliance breaks down, you need services ASAP. Otherwise, you may have to shut your doors or pay for thousands of dollars in perished items. United Service Co. is your go-to source for quick last-minute repairs and replacements. Our technicians can make most repairs the very same day. Trustworthy advice. Our team always gives dependable, trustworthy professional advice regarding your equipment. We never push sales on customers or trick them into making unnecessary purchases. If we recommend a repair or service, it’s because we honestly believe it will benefit your business. Need more reasons to choose United Service Co.? Give us a call and talk to one of our technicians. We’ll quickly assess your problem or need, recommend the right solution, and schedule you for timely services in your local New England location. You’ll know you’ve selected the right company from the very first time you speak with one of our caring representatives. We take dozens of calls daily regarding services for walk in refrigerators in Danvers. This piece of equipment is critical for the livelihood of several types of businesses. We use smart computer software to create and give price quotes immediately to customers over the phone. If you request a custom-designed cooler, we can immediately start drawing up the plans according to your desires and specifications. We know there is no time to lose in getting you the walk in your company needs to continue providing your services to customers. Count on us for fast, effective services. Whether you’re just starting to consider investing in walk in refrigerators in Danvers or you run an establishment that has relied upon them for decades, come to United Service Co. for exceptional services. We tailor our solutions to meet the specific needs of each of our customers. You’ll know without a shadow of a doubt that you’re paying for the exact service you need – no more, no less. To schedule services for your walk in refrigerators, Danvers residents can call (800) 761-0900 or contact us online.